Festive Roast Ham Whoop its nearly Christmas! And we are soon off for the holidays – well not exactly off, will be a slave to the cooker over the festive period. Luckily we are not in charge of the turkey, that’s our Mums job! But we are in charge of practically everything else – the day we can’t bare to think about food wise is Boxing day, when everyone is feeling rather ropy and tempers are short, so we are going to be big geeks and get prepared in advance. Our go to is a roast ham, easy to prepare in advance and lasts the whole week between Christmas and New Year, just serve with cheese, hot potatoes or bread, and with the left overs from the 25th that’s lunch done for a month! Or if you are feeling more adventitious, tear it up into a salad with some goats cheese, roasted walnuts, figs and a honey dressing and there you have yourself a festive salad. This is also a great one for New Years Day, sliced into a white floured bap with lots of mustard and some greens along side a spicy bloody Mary. 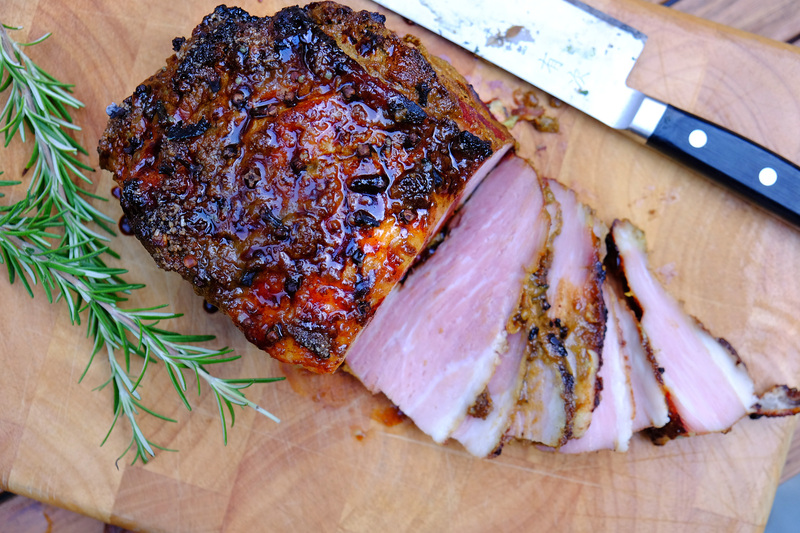 We are not pretending we came up with the idea of a Christmas ham, but this is our take on it, and keep this recipe up your sleeve as we actually cook it all year round, gammon is not just for Christmas! We are using deboned smoked gammon, a good inexpensive cut, just what you want at this time of year. We simmer the gammon gently before removing the string and carefully slicing off the skin, which we then slather with the sticky glaze before roasting it quickly to get that nice crunchy topping. The topping is one of the best bits, Lucy has an awful story when her Mum had prepared a huge ham for Christmas, she and some friends had come back after a party and a friend crept down in the night and ate the whole topping off the ham – the shrieks in the morning when her mother found the naked ham in the fridge, hell broke loose. When choosing the meat use higher-welfare pork, from a free range pig, lets go into next year from a strong starting point – saying no to pig factories. Happy Christmas everyone! We are using deboned smoked gammon, a good inexpensive cut, just what you want at this time of year. We simmer the gammon gently before removing the string and carefully slicing off the skin, which we then slather with the sticky glaze before roasting it quickly to get that nice crunchy topping. The topping is one of the best bits, Lucy has an awful story when her Mum had prepared a huge ham for Christmas, she and some friends had come back after a party and a friend crept down in the night and ate the whole topping off the ham – the shrieks in the morning when her mother found the naked ham in the fridge, hell broke loose. When choosing the meat use higher-welfare pork, from a free range pig, lets go into next year from a strong starting point – saying no to pig factories. Happy Christmas everyone!